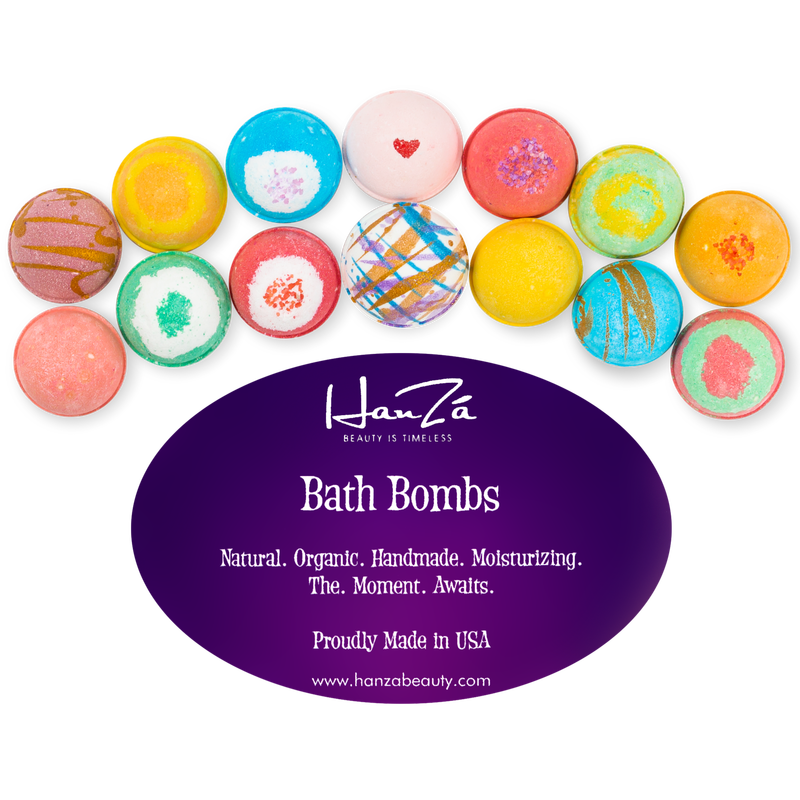 Bath Bombs by HanZá - A collection of 8 unique 2 oz All Natural Bath Bombs. Enjoy Spa quality experience in the comfort of your home. A hot bath with these fizzies provides therapeutic value such as stress relief, relief of stiff joints and muscles, sinus and congestion relief, mood enhancement and is an excellent moisturizer for dry skin. Infused with Vitamin A rich Organic Shea Butter and Essential oils that are rich in antioxidants, our gentle formula keeps your skin healthy and supple while providing aromatherapy to balance your overall mood and being. Our carefully formulated recipe ensures that it has the perfect balance of ingredients. You will not feel greasy after the bath and the smell is neither too soft nor too over-powering as compared to other brands. 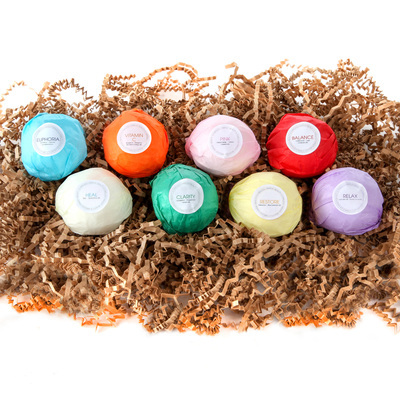 We do not use any artificial dyes in our bath bombs and ensure that they are Paraben-free and Cruelty-free. We care about the environment as much as we take your well-being seriously. 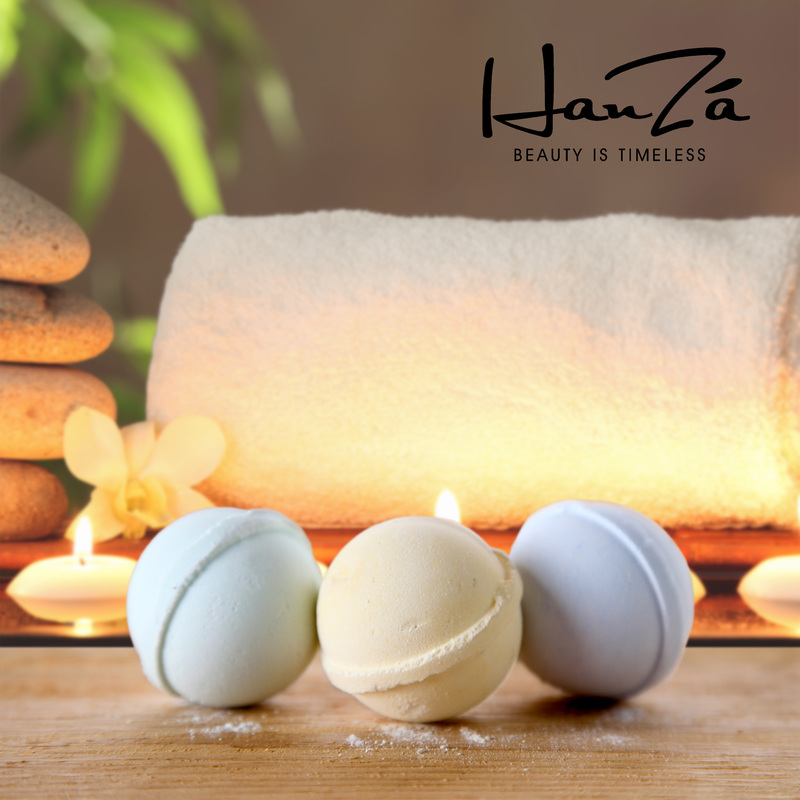 So enjoy this offering by HanZá, worry free. Euphoria: An exotic floral blend of Wild Rose and Jasmine essential oils accentuated by the rich, woody tones of Sandalwood oils will give you a feeling of intense pleasure and excitement. Use it how you please. Balance: Enjoy this herbal blend of Sage and Coriander essential oils complimented by soft woody tones from Cedar wood essential oils. Cedar wood promotes healthy, restorative, and uninterrupted sleep, Sage slows down symptoms of aging and Coriander is known for its aphrodisiac properties. Perfect balance. ​Pink: Imagine jumping into a tub of delicious cotton candy. 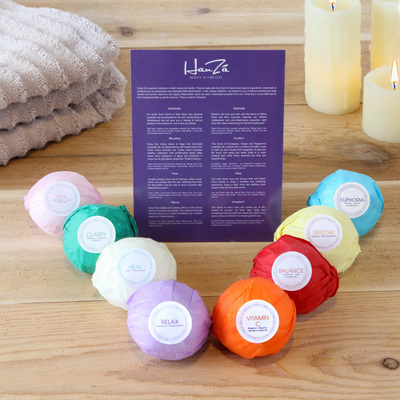 Relax and indulge with this skin softening bath fizzy. It’s the perfect and fun way to end a stressful day. Need we say more? Relax: Enjoy the soothing and calming effects of this classic blend of Lavender and Vanilla. This traditional favorite will help put you in a state of relaxation for a perfect night’s rest. Sweet dreams. Restore: Restore and heal your skin with this blend of Palma Rosa and Blue Lavender essential oils. Natural antibacterial and anti-inflammatory properties calm itchy skin while moisturizing for soft and healthy skin. Clarity: This blend of Eucalyptus, Ginger and Peppermint essential oils coupled with a steamy hot bath is sure to clear up your sinuses and congestion to give you the focus and clarity you need. Soak in a warm relaxing bath while these essential oils help you breathe better. Heal: This bath bomb stars the famous Aloe and Green Clove scents to bring a soothing and refreshing experience. 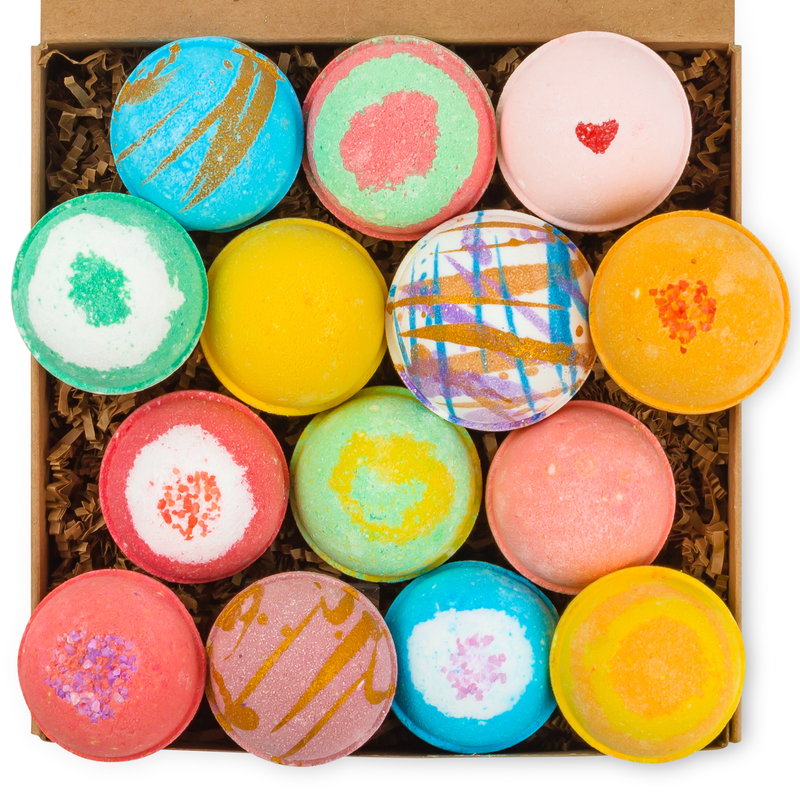 Enjoy a light, fresh and uplifting scent locked inside this fizzy bath bomb. Vitamin C: This blend of citrus fruits will remind you of the warmth of summer. It’s fresh, light, tangy and energizing smell will uplift your mood and relieve your stress. A dose of Vitamin-C is always good for you.